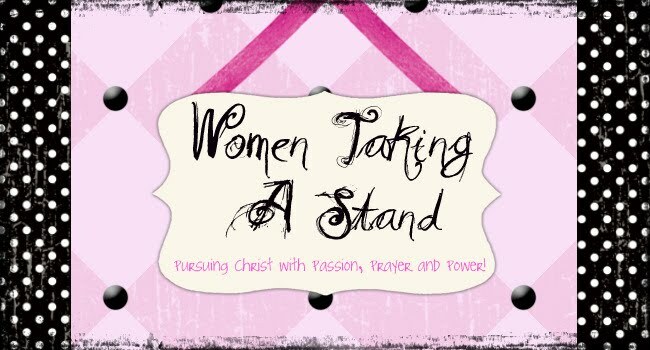 WOMEN TAKING A STAND: THANKFUL THURSDAY...birthday celebration! Don't you just love birthdays? It's a day set aside to celebrate the birth of "YOU"! You may get the day off of work, go out for lunch, have a party, blow candles out on a cake or you might even get a gift or two. No matter what you do on your special day, it is fun rejoicing in the life that God has given you. Around our house, it seems like all we have been doing is celebrating birthdays. 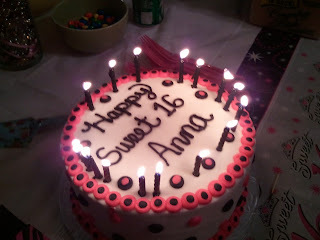 Since June, we have celebrated birthdays of 2 bonus daughters, 2 sons and now our "sweet 16" teen daughter! I love making their day special, whether it be a family dinner or a unique gift purchased with just them in mind. 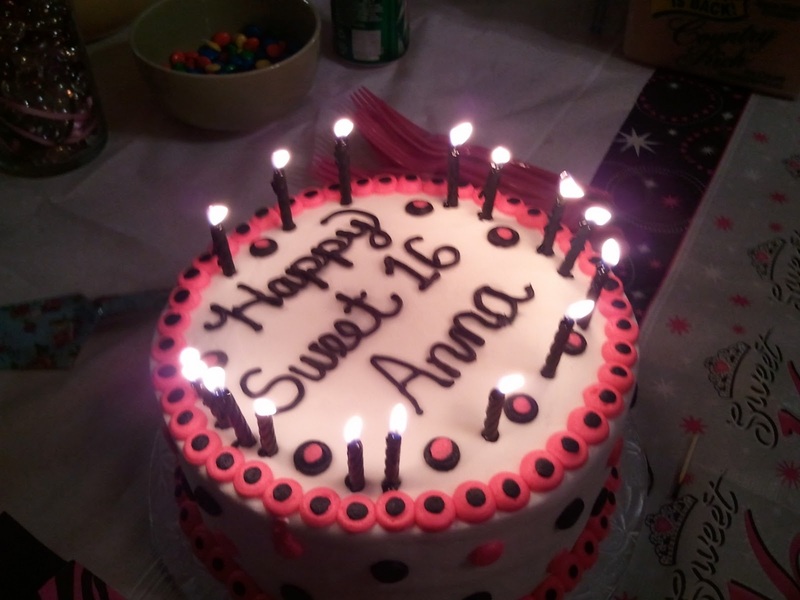 Our youngest, and only daughter Anna, just celebrated her sweet 16 birthday. It takes me back to the sweet memories of being a teenager and anticipating every new year, counting down to that BIG 1-8! As a young person, it seemed like it would never, ever arrive. But yet as quickly as I can remember, here it came and as quick as it came, it quickly left. That has been a few years now for me, but thinking about it caused me to stop and reflect on what I have done since that time of my life. Have I reached my goals? Have I made a difference? As I thought about this, I wondered about my spiritual birthday. As great as having birthday celebrations are, I wonder why we don't take as much time and care in remembering and celebrating our spiritual birthday...the day we gave our life and heart to Christ. The day of new birth. The day of salvation. I can remember some great birthday celebrations that we have had in our family. So many great parties with our children. But honestly, I can't think of any better celebration than when I saw each of my children come to Christ. Now that is a day worth celebrating! Some of us are at an age that birthdays are not much fun anymore. We don't look forward to them like we use to when we were younger. But our spiritual birthday is one of those things that should never get old. Each day, each year with God should get sweeter and sweeter. And as we look back in our life and reflect on what we have accomplished so far, the same can go for our spiritual walk. Have we pursued His Will? Have we heard His voice and obeyed? As Christians, we have been given a new life in Christ. Each year that passes we should find ourselves closer to Him. 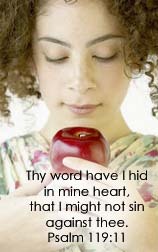 We should be meditating and understanding His Word more. We should be more confident in sharing His love with others. We should be growing, not dying. Today I am thankful for all the birthdays that God has blessed me with, not only the physical ones but the spiritual ones. It is my desire that the older I get, that I will not focus on my age as much as on the opportunity He has given me to be all I can be in Him! And may He find me growing and not dying. What is your grateful heart thankful for today? Share it with us as we celebrate THANKFUL THURSDAY! I am so glad that you stopped by to share your thankful heart with us! Hey, birthdays get mentioned in my TT post too ~ mine's on Monday! They are a wonderful time to remember God's goodness and abundant, rich blessings throughout the years! Hope you had fun celebrating!! It is my desire that the older I get, that I will not focus on my age as much as on the opportunity He has given me to be all I can be in Him! What a great goal, Laurie! I will remember that. Thanks for being our lovely host. I too think birthdays should be celebrated to the fullest. They are a blessing and reminder that God chose me! Hi Laurie.. your house sounds like mine in October when two daughters and my husband have birthdays all within a week! Happy Birthday to your daughter. May God bless her and guide her in these coming years. What a wonderful reflection on how we should measure our passing years. Thank you for sharing this inspiring post and for hosting this link up party. Its so nice to read everyone's blessings! Birthdays are always a time of reflection for me now that I'm older ... what have I accomplished with my life is definitely something I think about a lot. Missed being here and was so refreshed by your wonderful post. Have a great day! Interesting to read your post, as I just wrote about a celebration in our lives! Happy Thankful Thursday... God is sooo good! LACED WITH GRACE...What is it? A piece of my heart....Putting fish in a jar! A PIECE OF MY HEART....talk to strangers?